While floral potpourri is fragrant, potpourri made from dried fruit imparts a zest that fills your home with a crisp, fresh scent. Drying fruit is easy, and part of the fun in making this potpourri is choosing your favorite fruits to mix together. This is an ideal potpourri for kitchens and dining rooms, and it makes a welcome hostess gift. 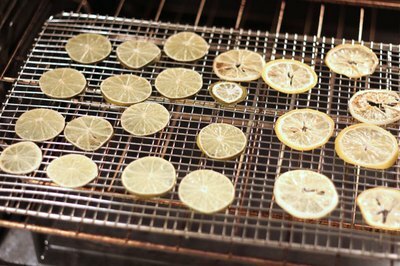 The process of drying fruit is simple, and it takes very little time. Citrus fruits like oranges, lemons and limes are perfect for potpourri because they retain their shape and color when dried. 1. Cut citrus fruits into 1/8"-thick slices. 2. Place fruit slices on a wire rack. 3. Heat at 200 degrees for about two hours, turning the fruit slices every half hour. Leave the oven door open so moisture can escape. 4. If the fruit is not completely dry after two hours, keep heating in 30 minute increments, checking to make sure that the fruit does not burn. Note: Avoid drying fruits like peaches and apricots, which are too moist and tend to be sticky when dehydrated. 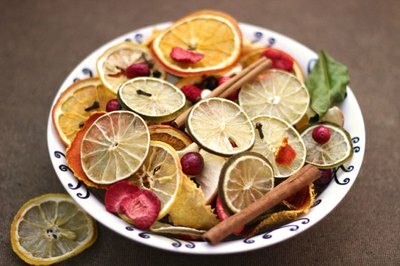 Citrus rinds and other fruit peels add texture to your potpourri. They are comparable to the branches and botanicals that complement floral potpourri. 1. Peel your fruit with a sharp knife or wide vegetable peeler. Keep the rinds in long ribbons if you can; the long peels twist dramatically as they dry. 2. 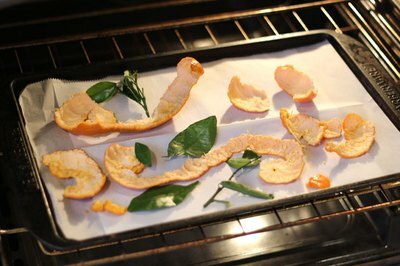 Place fruit peels on a baking sheet lined with parchment paper, and heat in a 200 degree oven for about two hours, turning them over every half an hour. 3. If the fruit still has leaves attached, add those to the baking sheet for drying as well. 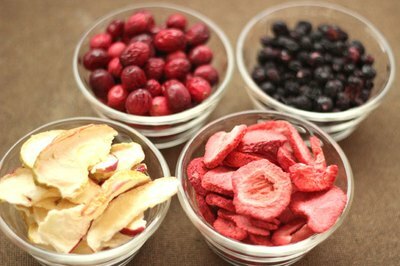 Freeze-dried fruit, which is available in food stores, has absolutely no moisture in it, so it works quite well in potpourri. The freeze-dried berries provide pops of color, and the freeze-dried strawberries actually look like rose petals. Select spices that will complement the fruit in your potpourri. 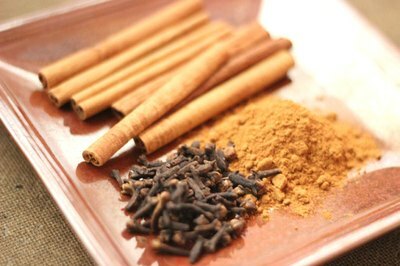 • Cinnamon sticks and whole cloves do double duty as botanical elements and fragrance generators. • Experiment with herbs like rosemary and thyme, which add a savory element to the sweeter smelling fruit. • Ground cinnamon powder coats the entire mixture in a delicious scent. • You can also add essential oils made from fruit extracts, like lime oil, to enhance the fragrance. After you have gathered all your main ingredients, place them in a plastic ziplock bag. • Add your spices, including any essential oils or fixatives, to the bag. • Shake the bag to evenly distribute the fragrant materials. • Allow the potpourri to sit in the bag overnight to bring out the scents. Unlike floral potpourri, dried fruit potpourri often has trace elements of moisture, so keeping it in a closed bag for a long period of time is not recommended. • For more tips on making potpourri, see this basic potpourri recipe.